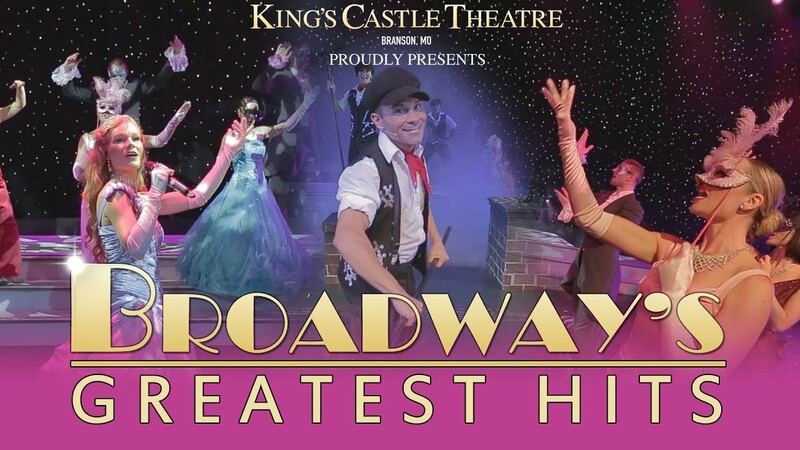 Broadway’s Greatest Hits at the King’s Castle Theatre is one of the most popular Branson shows that brings you fabulous, exciting highlights of the greatest Broadway musicals of the last 50 years. This show was a smash hit on the stage in London, England – now it’s in Branson and playing from April through October, with a show at 10 am on Friday, 2 pm on Sunday and Tuesday, and 8 pm on Saturday. This dazzling new musical extravaganza in Branson is an all singing, all dancing glittering salute to the Best of Broadway. This fast faced musical show features nearly fifty musical arrangements from over twenty-five different Broadway classics. Filled with fantastic music, glamorous costumes, and a charismatic cast of outstanding performers, this show is ideal for everyone who loves musicals, and anyone who simply enjoys delightful songs. You are sure to enjoy spectacular highlights from 42nd Street, Phantom of the Opera, Les Miserables, Cats, Chicago, Oklahoma, My Fair Lady, Wicked, Chorus Line, Hairspray, Mama Mia and many more. This fascinating musical show is the number one must see in Branson. If you love musicals, Broadway’s Greatest Hits is a fantastic addition to any family getaway in the Ozarks. Broadway’s Greatest Hits is an entirely new production show unlike anything in Branson. This is one of the most popular and beloved Branson shows that you don’t want to miss this season. The show features a talented cast that excels both in vocals and acting. With a wide repertoire among them, they’ll bring musical renditions of Broadway’s favorite songs. The songs that are played in the show are hand-selected from Broadway shows, offering something for everyone. If you love Broadway music, you’re bound to have a fun time dancing and singing along to some of Broadway musical numbers. Playing the very best of Broadway music, the show is both fascinating and entertaining. The talented entertainers are dressed in sparkling, extravagant costumes and many of the singing and dancing acts are choreographed for a stunning performance. Featuring nearly fifty musical arrangements, this show creates an unforgettable evening experience of fun for the whole family. You’ll find the show fascinating to watch as it features great talent and energy that will have the entire audience clap and on their feet for a standing ovation. Broadway’s Greatest Hits is truly a magical production show that is sure to capture the interest of all the audience from start to finish. With a complete cast of international dancers, singers, entertainers, and performers – the show brings the very best of New York City’s most famous live theatre production to the Branson stage. This fascinating show is one of the most exciting new shows to appear in Branson. If you’re a music lover, you're bound to have a fun time dancing and singing along to some of your favorite Broadway musical numbers in this show. So, if you like Broadway music, do not miss out this fascinating Branson show and enjoy Broadway's Greatest Hits at the King’s Castle Theater.